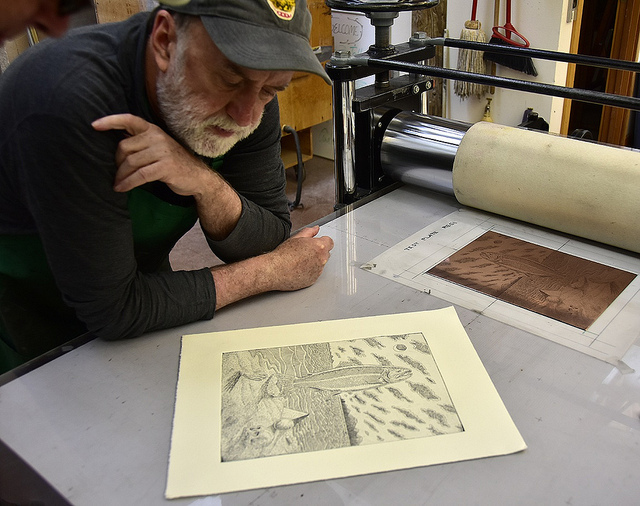 The annual Jordan Schnitzer Printmaking Residency was established in 2002 to provide artists with little or no printmaking experience the opportunity to explore a new creative medium with guidance, instruction and technical assistance from a professional etching printer. The residency duration is two weeks. We are not taking applications for the 2019-2020 cycle of printmaking residencies. Printer, Julia D'Amario worked at Pace Editions in New York City for seventeen years, before moving to rural California in 2006. Julia first came to the Sitka Center as a resident artist in 1997. 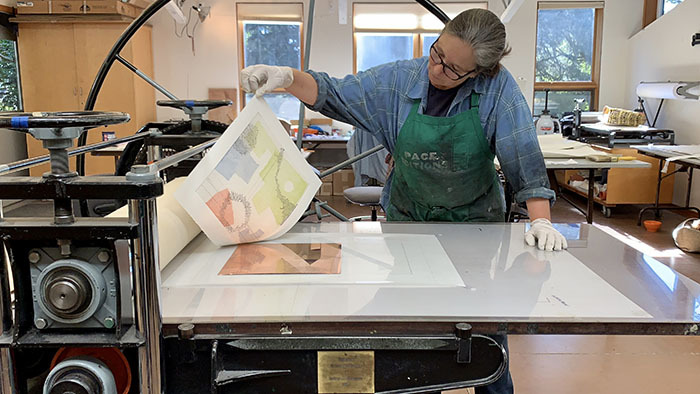 She developed a deep connection to Sitka and the Oregon coast and enthusiastically agreed to become involved in developing the print program. Jordan Schnitzer, one of Portland's most prominent print collectors, generously pledged his support for the project and has been funding it since its inception. Visit our Past Residents page to see all of the past Sitka Center residents, including Jordan Schnitzer Printmaking residents. ‍Please note: This opportunity is for artists who have no prior printmaking experience. If you have any questions, you are welcome to contact us at (541) 994-5485 or email.